Brooklyn, NY, WPH Press, 8/6/17- Finals Sunday in at the 2017 USHA National One-Wall Championships promised a first time men’s pro singles champion, as perennial contender Billy O’Donnell met first-time small ball singles competitor Timbo Gonzalez. Timbo seized game one by applying constant pressure to O’Donnell, chasing down the Bus’ best serves and kills to frustrate and tire O’Donnell. With O’Donnell appearing mentally and physically fatigued midway through the first game, Timbo pounced, hitting power serves to the left and “first-strike” kills. Timbo continued his assault in game two, building a 14-0 lead. O’Donnell would break Gonzalez’s momentum, switching to a power serve to the right and cutting the deficit to 9-18, but the comeback started too late, as Timbo closed out the match. 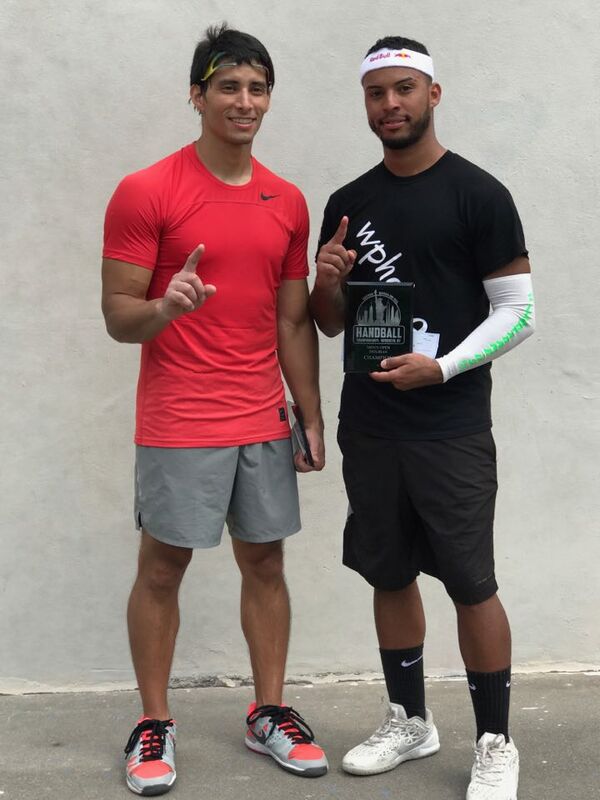 With the victory, Timbo became the first player to win the WallBall title and USHA One-Wall Small Ball title in the same year and solidifying himself as the game’s greatest cross over star. Timbo teamed with Jurell Bastidas to slam the pro brackets, defeating Willie Polanco and Mike Schneider in a three-game pro doubles final. Andy Rousseau slammed the Master’s brackets, taking home the first Master’s prize money bracket at the USHA One-Wall Nationals by defeating Robert Sostre and teaming with Jared Vale to defeat Pete Pellegrini and Robert Sostre in the Master’s Doubles. 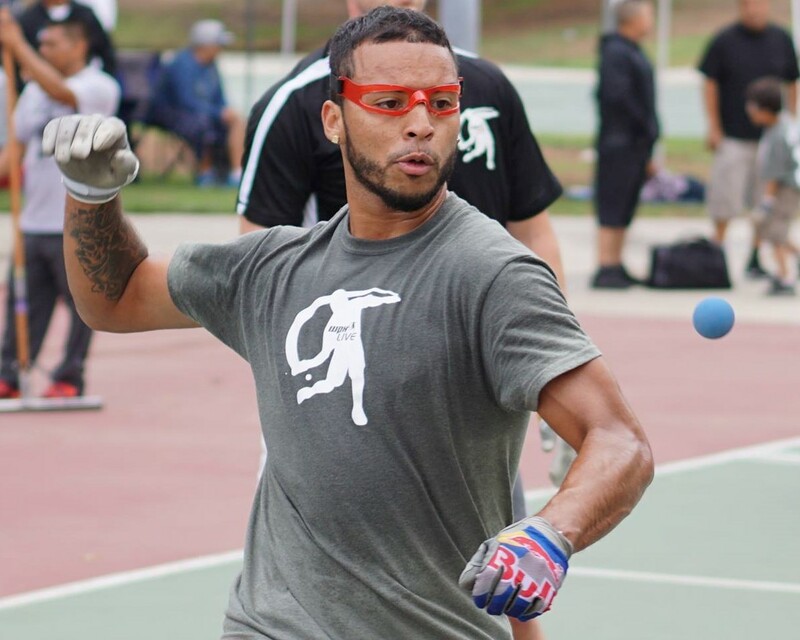 Congratulations to Timothy Gonzalez for slamming the 1 wall small ball national handball championship w/United States Handball Association this weekend. Gonzalez, with the doubles win, is the first player in Handball history to slam the 1 wall singles and doubles in small ball and big ball (wallball) in the same calendar year! Gonzales had not hit a small ball since April ’17 (Salt Lake City Player’s Championship 4 wall Qualifier w/WPH). Brooklyn, NY, WPH Press, 8/5/17- The 2017 USHA National One-Wall Men’s Pro singles field was down to four on Saturday in Coney Island, with defending champion Tyree Bastidas, perennial contender Billy O’Donnell, first-time Small Ball 1-Wall singles participant and WPH Outdoor #2 Timbo Gonzalez and former 1-Wall singles national champion Willie Polanco. Billy O’Donnell put his past losses to Bastidas in the rear-view mirror in the upper bracket semifinal, dominating game one to put himself on the brink of a finals appearance. The defending champion rallied, building a 15-6 lead in game two and seemingly on the verge of forcing a third game. O’Donnell scored nine unanswered points to tie the score at 15, only to see Tyree score three points in a row to take an 18-15 lead. O’Donnell scored four in his next service inning to take his first lead of the second game and following a side out, O’Donnell hit an ace to the left and scored the final point on a Bastidas error to stun the defending champion. ver, the Cinderella Story [Gonzalez] lead his team to a 21-6, 21-14 (unofficial score) win and will advance to the final. 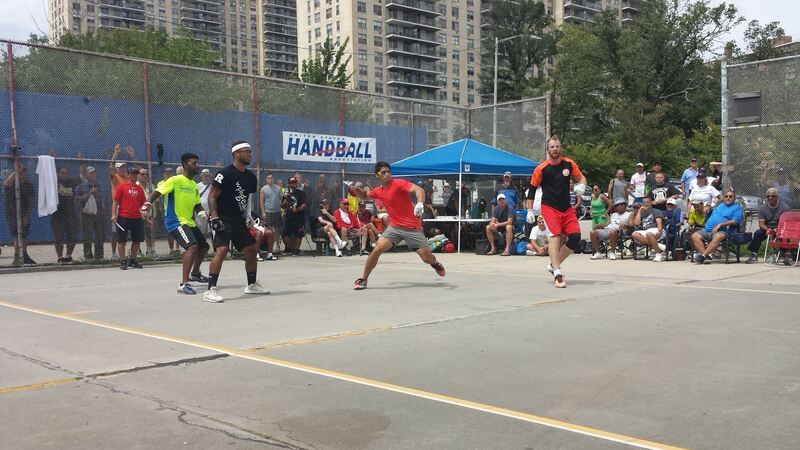 For Gonzalez, it appears he would be the first player in handball history to win the pro singles and doubles in small ball and big ball at the nationals in the same calendar year (slamming both events) with two wins on Sunday. Mike Schneider and William Polanco advanced in the bottom bracket with a hard-fought win against Rebaza/Calle and will face J. Bastidas/T. Gonzalez in the pro men’s final. “This game takes a lot out of you,” said Gonzalez after his doubles win on Sunday. “You have to have speed and conditioning to play with this small ball.” Gonzalez has not hit a small ball since playing in the 4 wall qualifier in Salt Lake City [circa April, 2017], but looks to continue after this event. “I need to worry about Sunday, then I’ll consider Toledo [3 wall nationals in three weeks]. Follow the results by visiting R2sports, ushandball.org and through Facebook and Twitter pages. Brooklyn, NY, WPH Press, 8/4/17- The Men’s Pro Singles quarterfinals featured the game’s best in action, with four advancing to the weekend’s final rounds. Defending champion Tyree Bastidas needed just 30 minutes to dispose of former Race 4 Eight Elite 8 member Stephen Cooney to continue his bid for his sixth title in Coney Island. “I’m just happy the Race season is about to start,” declared Cooney. “Tyree was just too good today.” Billy O’Donnell had little difficulty in defeating good friend and former 1-Wall finalist Mike Schneider to setup an upper bracket semifinal showdown with Tyree on Saturday morning. Second-seeded Willie Polanco cruised past former national and world 1-Wall champion Joe Kaplan, less than a year after suffering a serious heart attack. Jurrell Bastidas entered the event as the hottest player in 1-Wall Small Ball this summer, having won the Speaker’s Cup two weeks ago. 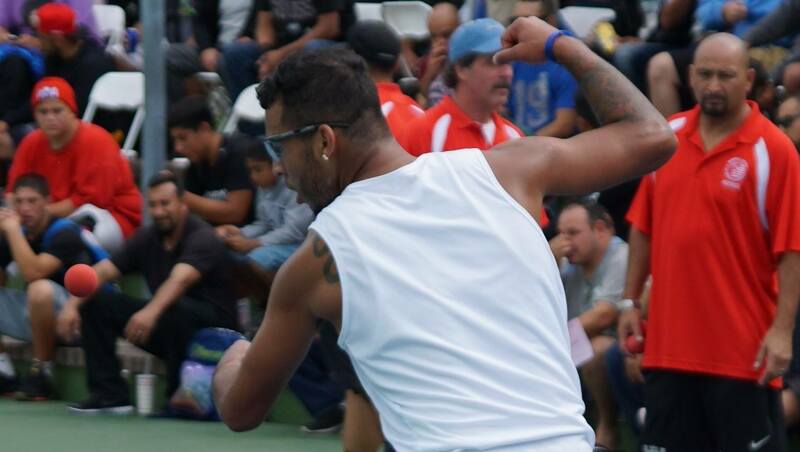 Jurell faced cross over star Timbo Gonzalez, who was playing in his first 1-Wall Small Ball tournament and only in the draw because Cesar Sala was unable to play. Jurell raced to an 8-0 lead in game one, largely due to his sensational serve. After falling behind, Timbo was able to neutralize Jurell’s bullet serves and work his way into rallies. “His serve was just out of this world,” stated Timbo. “I just used my reflexes and speed to try to get into points.” Once in rallies, Timbo used one of his greatest weapons, outstanding court coverage. “I was making digs (on his kills) and I noticed he stopped going for his kills because of it.” Timbo eventually tied the score at 15 and took command of the match by completing the comeback to take game one. “I knew I could not allow Jurell to get on a run in the second so I played really aggressive and hit hard 1-Wall flat hand drives down the line. He’s not used to that shot and it caught him off-guard. I starting putting away setups one by one with hard sidearm open hand kills.” Timbo cruised in game two to face Polanco in the bottom bracket semifinals. Brooklyn, NY, WPH Press, 8/3/17- The 2017 USHA National One-Wall Championships are underway in Coney Island, with the game’s top 1-Wall stars battling for the most coveted prize in 1-Wall Small Ball handball. Tyree Bastidas entered the event as the five-time defending champion, while Race 4 Eight star Stephen Cooney, RFC Outdoor Champion Billy O’Donnell, former 1-Wall national finalist Mike Schneider, 1-Wall Big Ball #1 and cross over star Timbo Gonzalez, white-hot Jurell Bastidas and veteran 1-Wall Small Ball former national champions and legends Joe Kaplan and Willie Polanco have their sites set on the title. The round of 16 saw each of the top seeds advance, as Tyree, O’Donnell, Jurell, Timbo and Kaplan advanced in two games, Cooney advanced via forfeit, and Schneider and Polanco surviving tiebreakers to book their spots in the quarterfinals. The action promises to be sensational on Friday at Coney Island, as the top stars will face off for spots in the weekend’s final rounds.